A team of European researchers from the KTH Royal Institute of Technology, Chalmers University of Technology and Uppsala University in Sweden, along with scientists from RWTH Aachen University and AMO GmbH in Germany, has discovered that when graphene is integrated with the metal of a circuit, contact resistance is not impaired by humidity. This finding may help to develop new sensors with a significant cost reduction. To achieve efficient sensors, graphene needs to make good electrical contacts when integrated with a conventional electronic circuit. Such proper contacts are crucial in any sensor and significantly affect its performance. But a common problem is that graphene is sensitive to humidity, to the water molecules in the surrounding air that are adsorbed onto its surface. The H2O molecules change the electrical resistance of the graphene material, which introduces a false signal into the sensor. 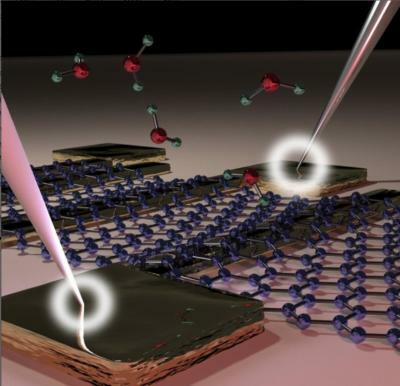 However, the team has found that when graphene binds to the metal of electronic circuits, the contact resistance (the part of a material's total resistance due to imperfect contact at the interface) is not affected by moisture. "This will make life easier for sensor designers, since they won't have to worry about humidity influencing the contacts, just the influence on the graphene itself," explains Arne Quellmalz, a PhD student at KTH Royal Institute of Technology (Sweden) and the main researcher of the research. The study has been carried out experimentally using graphene together with gold metallization and silica substrates in transmission line model test structures, as well as computer simulations. "By combining graphene with conventional electronics, you can take advantage of both the unique properties of graphene and the low cost of conventional integrated circuits." says Quellmalz, "One way of combining these two technologies is to place the graphene on top of finished electronics, rather than depositing the metal on top the graphene sheet."